Early in January, the Jefferson City Daily Capital News reported it had learned Witten, acting as the manager for Snodgrass, had agreed to a year’s contract with the Chicago Orpheum Company, which would book the two on the vaudeville circuit. Snodgrass was to get $600 a week, of which one-fourth would be paid to Witten. Eighteen months in prison and Witten’s promotion of Snodgrass’ talents on the radio had been an economic boom for Snodgrass. Before he went to prison he had been a dance hall musician in St. Louis, earning about $30 a week. Being booked by Martin Beck’s Orpheum Circuit was a major step for Snodgrass and Witten. Beck, one of the nation’s leading vaudeville entrepreneurs, controlled theatres from the Midwest to California. “Snodgrass’ reputation as a pianist has been built largely because of the great amount of publicity which he has been given by Announcer Witten, who has been practically in charge of the local station. Witten has devoted an unusual amount of the station’s time to exploiting Snodgrass and it is fitting that he should be rewarded for his efforts,” the newspaper noted. “If…Witten…devotes as much attention to exploiting him in the future as he has in the past, then Snodgrass’ star should shine bright and long in the firmament of the great,” the newspaper concluded. It was a chance, also, for Snodgrass to speak. He thanked officials for their good treatment during his stay. He thanked the people with the radio station, and promised his audience he would stay away from liquor, which had helped put him in prison to begin with, and to go straight. At the end of the broadcast, WOS Station Director A. T. Nelson, gave Snodgrass $3,587.35 that had come in as donations from listeners. The signal from the dome of the Missouri Capitol that dark January night reached thousands of listeners, who sent more than 3,700 telegrams that night. The next day, Governor Baker signed the commutation document, effective the next day, the 16th. He was urging passage of a bill prohibiting the employment of convicts outside the prison walls, except for the warden’s residence. The bill also provided drastic punishment for convicts discharged from prison who stayed in the capital city. It was later defeated in the Senate when only ten Senators voted for it; nine voted against; and 15 managed to be absent. In early 1926, Snodgrass made several records for the Brunswick music label, which publicized him as the “King of the Ivories.” We have found a few of those old 78s. Perhaps others who read the story of Harry Menford Snodgrass will find others. Brunswick 2850 Three O’Clock in the Morning (asf) (apparently his theme song)/ The Moonlight, A Waltz With You. J.M. Witten announcing. Brunswick 3137 Canadian Capers (MP3) / The World is Waiting for the Sunrise (MP3) . Recorded Feb. 7, 1926 J. M. Witten announcing. Brunswick 3239 Maple Leaf Rag (MP3) / Along Miami Shore (MP3) Recorded in April, 1926. 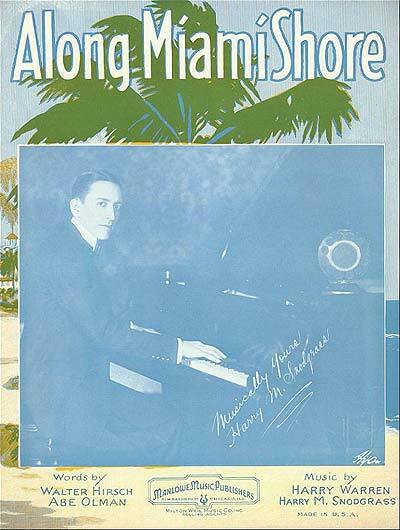 Sheet music for “Along Miami Shore” indicates Snodgrass co-wrote the music with Harry Warren, who had a long career that saw him write original music for 122 movies, television shows and stage shows before his death in 1981. 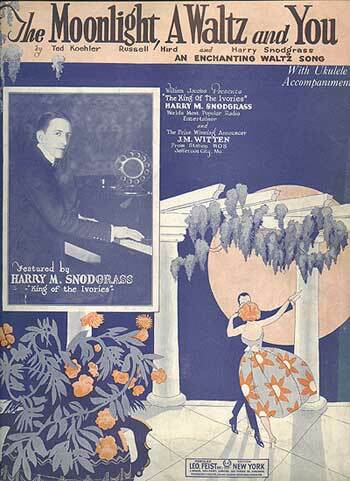 One version of the sheet music had a picture of Snodgrass on the front, an early radio microphone perched on his piano. (Larger version). Jenkins suggests Warren probably was a major performer of the song, which was briefly popular. “A lot of times performers of songs (most notably Al Jolson and Eddie Cantor) had their name put on the sheet music (usually as a co-lyricist) to several songs that they made popular, but had no hand in creating, so this is probably the same case here.” Snodgrass also cut some songs on piano rolls for Wurlitzer. We know of four: Farewell, a ballad. WCPO (Wurlitzer Concert Piano Orchestra) 9197; I Found a Way to Love You, But I Can’t Find a Way to Forget, a waltz. WCPO 9197; Land of My Sunset Dreams, a waltz ballad. WCPO9197; and Farewell,” QRS, 3113. By the end of 1927, Snodgrass was living in Springfield, Illinois, about half way between St. Louis and Chicago. On December 29th, he filed an application with Missouri Governor Sam A. Baker asking that his citizenship be restored. His petition was signed by 20 people from St. Louis, who swore that they were personally acquainted with him and that he had been a good citizen. A supporting letter from Circuit Judge John M. Calhoun accompanied the petition, noting that Snodgrass wanted restoration of his rights of citizenship so he could rejoin the musicians union, of which he’d been a member before going to prison. “He tells me that if his citizenship is restored he will be readmitted to membership in that union which will enable him to better earn a living for himself and family,” wrote Calhoun. The documents are housed in the State Archives, part of the Secretary of State’s office. The 1925 commutation documents is Vol. 3, page 123 of the Commissions Divisions records for Commutations under the prison merit system; the restoration of citizenship is in Box 26f3 of those same records; the register of inmates #25852. 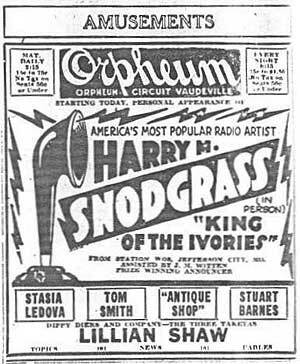 Harry Snodgrass continued to tour after his vaudeville days although his schedule was never as intense as it was during his time on the Orpheum circuit. We have found indications that he performed in Midwestern theatres from time to time, still relying on his notoriety as—as one billing put it—America’s first radio star. He apparently appeared on behalf of radio stations, performing for several days at certain times. During an appearance on a station in Terre Haute, Indiana, he performed in the window of a department store which was promoting a specific brand of radio. Had he begun his radio career before he went to prison and reached stardom on WOS? A history of WHAJ in Bluefield, West Virginia written by Ralph Shupe notes “Harry Snodgrass, of ‘Three O-Clock in the Morning’ fame, is said to have made his radio debut on WHAJ.” While it is possible that Snodgrass played on the radio station before he got into trouble in St. Louis, it is more likely that he performed there after ending his vaudeville career in circumstances similar to his Terre Haute experience. In December, 2006, Harry Snodgrass’ great-granddaughter and his daughter-in-law found this story on the Missourinet website. Within days, they provided us with some details about the rest of the life of Harry Snodgrass. In the 1930s, Harry, his son Harry Van, and Louise left Springfield and moved to the small town of Palmyra, Illinois. He and Louise separated for a time but as Harry’s health began to decline he returned to her. He died in 1937 at the age of 42 from a “heart block,” as his death certificate says, just 12 years after that triumphant last concert on WOS. Louise, who stuck with him through sickness and in health, through good times and bad, lived into her 90s and died many years later. Both are buried in Palmyra. His son, Harry Van, died November 28, 1978 in Chula Vista, California. His widow, Marjorie, tells us the family has few photographs or other items connected with the King of the Ivories. A book filled with many photographs was stolen from the family car a long time ago. From time to time a newspaper clipping, a vaudeville poster, or a person who remembers seeing Harry Snodgrass perform comes to light. Perhaps others will stumble onto this story, as Marjorie and Nicole Snodgrass did, who can reveal more of the story of the King of the Ivories, America’s first radio star, Harry Snodgrass.